When you want to scan a number of originals at one time, originals with pages of different sizes, or originals with folds, configure the original settings according to the original type. For details, refer to Here. If necessary, configure copy settings. The setting change is reflected on the image of [Output]. Therefore, you can configure the settings while checking the output image. To reconfigure settings, press the Reset key. For details on copy settings, refer to the respective columns of the following table. To copy while specifying the image quality, density and etc. If necessary, specify the number of copies using the Keypad. Tapping [No. of Sets] displays the Keypad. Pressing the 10 Keypad key (default: Register key 3) displays the Keypad on the Touch Panel, enabling you to enter numeric values. To change the number of copies, tap [C] (Clear). If desired, tap [Check Setting] before starting a copy, and check the settings. The original is scanned, and copying starts. If you press the Stop key while scanning or printing an original, processing is stopped, and a list of inactive jobs is displayed. To cancel the operation, delete the stopped jobs from the list. If [Ready to accept another job.] appears while printing a job, you can scan the next original. You can change the default copy settings to suit your environment. For details, refer to Here. You can leave the Keypad displayed in order to be able to enter the number of copies (default: [When Number of Sets is pressed]). For details, refer to Here. 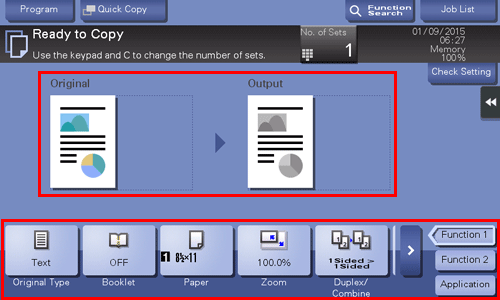 To configure various copy settings smoothly, you can collectively display the basic copy settings in a single screen, and arrange frequently-used keys in the main screen. For details, refer to Here.